There is a real risk that the West could use another alleged chemical attack to justify actions in Syria which could spark a dangerous crisis, former UK ambassador to Syria Peter Ford said. Speaking on RT's political show CrossTalk with Peter Lavelle, Ford warned that Syria watchers were too focused on a potential crisis in the Golan Heights (Syrian territory occupied by Israel since 1967 and a source of numerous tensions between Damascus and Tel Aviv). Yet, the real threat of escalation comes from the potential of another "Douma-like situation," the ex-envoy said, referring to April's alleged gas attack in a besieged rebel stronghold in Eastern Ghouta, which resulted in US-led airstrikes against the Syrian government's military and scientific facilities. "We're in danger of looking at the wrong flashpoint. It's not the Golan. The real potential flashpoint is a return to a Douma-like situation," Ford said. "Remember in April, we were close to World War 3. We were talking in those terms. And the same scenario could be reproduced at any moment, but most likely it will be reproduced when the moment comes for the siege of Idlib, which is some months down the track. "But it's perfectly foreseeable that the same conditions will be produced, and I believe there will be another fake chemical attack, which will trigger a really dangerous crisis." Notably, the US-led missile attack on Syria was conducted without waiting for a formal investigation to determine if chemical weapons had actually been used – and if so, who was to blame. The first Western journalist to reach Douma, Robert Fisk, filed a report which raised serious doubts about the veracity of the claims made by the Western-backed White Helmets, who provided videos and photographs allegedly showing the aftermath of the gas attack. 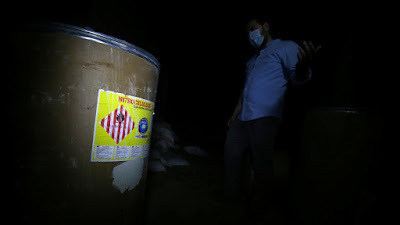 His skepticism was later confirmed by the Organization for the Prohibition of Chemical Weapons (OPCW), which stated in a recent report that there were no traces of chemical weapons found in samples they took from the town. However, samples from two sites tested positive for chlorine, but the concentration and source of the chlorine has yet to be determined. The threat of "another Douma" is especially worrying because with fewer and fewer cards to play in Syria, Washington may be looking for any excuse to directly intervene in the all-but-over conflict. "I don't think the Americans have much to negotiate with in Syria. The boots on the ground are very limited in numbers, effectively they're just a tripwire," Ford said. "The pro-US forces in the south are in the process of being rolled up. That only leaves the north, the Idlib area which is dominated, in terms of external support, by Turkey, not the US." The former diplomat also noted that Trump's preoccupation with Iran seems to be geared towards making the Israelis happy, and that it's not clear whether or not he'd actually go through with a military attack on Iran. "Trump has already got a lot of enemies back home. He's got the security state on his back, he's got almost everybody on his back. He cannot afford also to have the Israel lobby on his back," Ford noted. "So this combined with the fact that he has family links with Israel, pushes him in the direction of being an Iran hawk. Now this is scary, and if he gets dragged down that path, we may be in for a very bumpy ride indeed. "But I'm not sure his heart is in it. I sense that it's opportunistic and dictated by his standing domestically in the US. He can't have too many enemies at the same time." While Ford expressed concern over Trump's posturing in the Middle East, he said that the president's disdain for business as usual in Washington could be his – and the world's – saving grace. "There's two keys to understanding Trump. One is this so-called isolationism, or nativism, the other is his narcissism. And his narcissism in a way is his redeeming feature, because it makes him depart from the orthodox Washington consensus," Ford said. "He's like a Gulliver who's pinned down by the Washington consensus, by this myriad of little advisors around him. The only time he's really free is in the middle of the night at 3 AM when he can tweet and nobody can stop him, or when he's in a summit. One-on-one. "Especially when they keep advisors out of the chamber. These are the times when he can be Donald. I think Donald should be more Donald if anything."